Time tested, simple tube single ended stereo amp delivers that important first sweet watt that audiophiles love. This design has been optimized for low distortion and high efficiency with no negative feedback or any sort of servo correction circuitry. We suggest that you only use tubes that yield good test results for the best amp performance. As an option, silver wire can used for both in primary and secondary in our nickel input transformers. These transformers provide matching input/output source impedance, ground loop isolation along with consistent wide bandwidth, just as found in pro-audio applications. Also as an option, output transformers can use partial silver wire for the secondary windings. Silver gives greater low level detail and resolution. It should be noted that the ElectraPrint single output impedance secondary is designed to give the flattest and widest response curve. Bass volume control gives the user the ability to easily adjust the sub woofer with different recordings. This is built with an 80 Hz cut for the sub woofer. The amp runs full range unless the high pass filter is switched in for use with a sub woofer. Enough gain is provided by the driver stage so that no pre-amp is needed. Our integrated 45 SE amp will accept your CD, tuner or phono stage. Having both Hi Z and Low Z signal taps for the input transformer gives perfect matching to tube or transistor signal sources. Solid state rectification is used to give lower bass distortion. 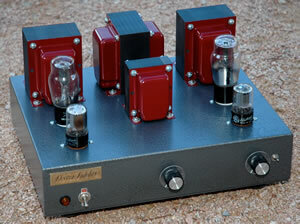 If you would prefer to have your 45 Silver Stereo Amp built by us, we charge $2,900 with tubes or $2,800 without tubes. Tubes are from our stock. All transformers made by Electra-Print Audio and use our Silver Input and PSSS Output Transformers. Finished amps may be slightly different from that pictured.